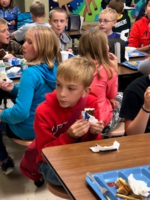 Students at Koch Elementary enjoyed an ice cream bar for $1 to support Tye Schaffer's family. Tye was recently diagnosed with Leukemia. Milbank Middle School Student Council organized the event.